Swanton’s Bridget Harlett, left, goes for possession of a loose ball in a game at Evergreen this season. Harlett was first team all-district in Division III. 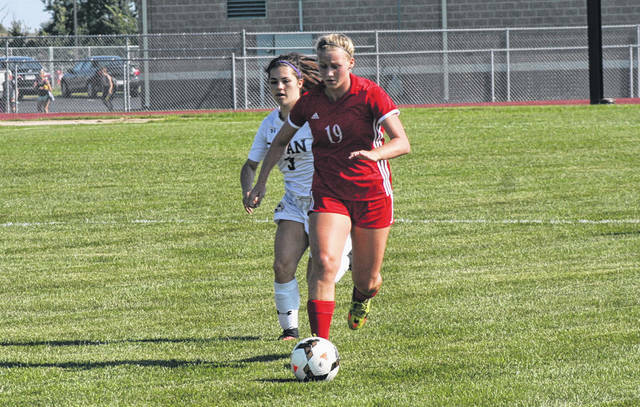 Daisy Giguere of Wauseon races upfield in a game versus Bryan this season. She was second team all-district in Division II. 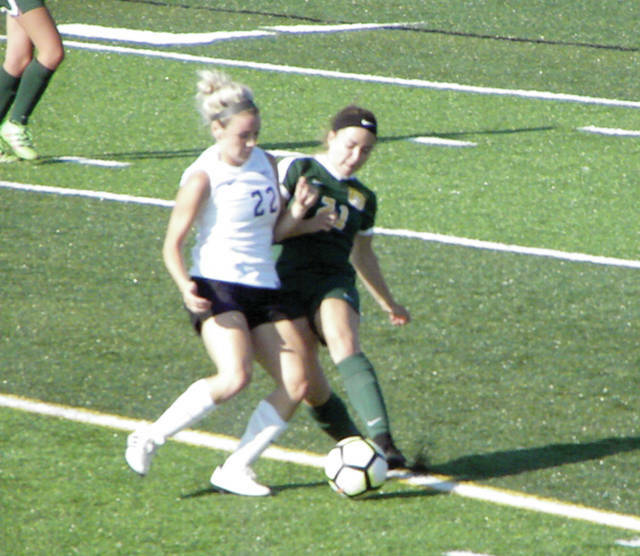 Local girls frequented the all-district girls soccer list that was recently announced. In Division III, Andi Peterson made the first team for Archbold. Chloe Nofziger was second team all-district for the Blue Streaks. Madison Gigax and Regan Ramirez were honorable mention. Bridget Harlett of Swanton was also on the first team. No one made the second team for the Bulldogs, but Morgan Pine, Aricka Lutz and Averie Lutz were honorable mention. For Evergreen, Asia Gensch and Paige Radel were second team all-district. Emma Bettinger and Sydney Woodring received honorable mention for the Vikings. Daisy Giguere of Wauseon made second team all-district in Division II. Honorable mention all-district for the Indians were Anna Koenig, Mya Suarez and Kadence Carroll. Audrey Lerch, sr., Bowling Green; Meg Voigt, jr., Bryan; Reilly Cox, jr., Celina; Jency Jenkins, sr., Elida; Colette Askins, jr., Lake; Chandler Clark, soph., Lima Bath; Sophia Fusillo, jr., Lima Shawnee; Madi Mason, jr., Lima Shawnee; Megan Richardson, sr., Napoleon; Hannah Pierce, jr., Rossford; Emma White, sr., St. Mary’s Memorial; Morgan Beyer, sr., Toledo Central Catholic; Emily Ruppert, sr., Wapakoneta. Player of the Year: Jency Jenkins, Elida. Tammy Aguilera, jr., Defiance; Cienna Kuhn, sr., Elida; Emelie Engelien, sr., Maumee; Chayah Keller, jr., Maumee; Teri Miller, jr., Lake; Ainsley Miller, jr., Lima Bath; Tessa Jordan, jr., Lima Shawnee; Grace Hopkins, soph., Napoleon; Emma Wibbeler, jr., St. Mary’s Memorial; Alivia Oney, sr., Upper Sandusky; Tori Carter, sr., Wapakoneta; Abbigail Ruppert, sr., Wapakoneta; Daisy Giguere, jr., Wauseon. Ally Richardson, Allen East; Andi Peterson, sr., Archbold; Alex Hoeffel, jr., Continental; Zoe Chisolm, soph., Cory Rawson; Maddie McConnahea, sr., Delphos Jefferson; Hannah Owens, sr., Eastwood; Kenna Souder, fr., Eastwood; Marissa Young, sr., Genoa; Lauren Langhals, sr., Kalida; Savanah Richards, sr., Liberty-Benton; Sophie Aschemeier, soph., Liberty-Benton; Alexis Rickenbacher, soph., Liberty-Benton; Samantha Engler, soph., Liberty Center; Avery Rice, sr., Lima Central Catholic; Natalie Koenig, soph., Miller City; Bella Iorio, sr., Ottawa Hills; Casey Knippen, sr., Ottoville; Bridget Harlett, sr., Swanton. Player of the Year: Kenna Souder, Eastwood. Chloe Nofziger, jr., Archbold; Kayla White, jr., Bluffton; Amber Daly, jr., Cardinal Stritch; Grace Bruns, sr., Coldwater; Asia Gensch, jr., Evergreen; Paige Radel, fr., Evergreen; Tatum Neumann, jr., Genoa; Bailey White, jr., Kalida; Jillian Hoffman, soph., Liberty Center; Annika Wilker, fr., Lima Central Catholic; Rylee Hazlett, sr., Northwood; Erin Kaufman, sr., Ottawa-Glandorf; Meredith Greeley, fr., Ottawa Hills; Alex Rothlisberger, sr., Riverdale; Kelsey Shaffer, jr., Spencerville; Alyssa Wagenknecht, jr., Toledo Christian; Hannah Missler, jr., Van Buren; Claire Rothert, jr., Woodmore.